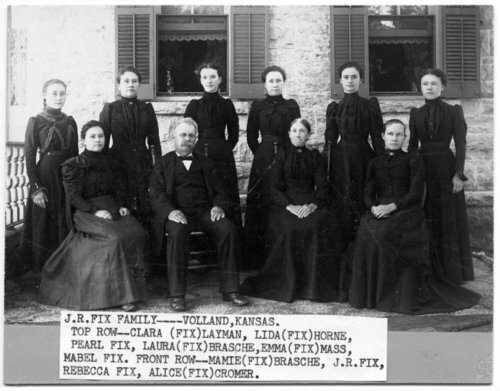 Several photographs of members of the John Robert Fix family. After the Civil War, J. R. Fix married Rebecca Larch and they moved to Wabaunsee County, Kansas. Included here are photographs of their daughters: Alice, Clara, Emma, Laura, Lida, Mabel, Maime, and Pearl. There are also photographs of J. R. Fix's siblings, including Malinda (Fix) Falk, Samuel Fix, and Sarah (Fix) Simon.